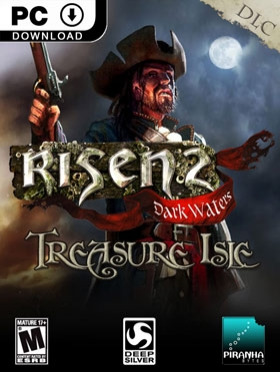 NOTICE: Requires the base game Risen 2: Dark Waters in order to play. Activation key must be used on a valid Steam account, requires internet connection. ABOUT THE GAMEEmbark on a brand new adventure in pursuit of the legendary treasure of Captain Steelbeard. Join Captain Steelbeard's daughter, Patty, on a journey to an unknown island that offers new environments to explore and many puzzles to … solve, treasures to loot and mysteries to unravel. An all-new exclusive legendary item awaits those who have the courage to undertake this quest. SYSTEM REQUIREMENTS Minimum System Requirements: OS: Windows XP (with Servicepack 2) Processor: Dual Core with 2.1 GHz Memory: 2 GB System RAM, 5,5 GB free HDD space Video Card: 512 MB Radeon 3870 / GeForce 8800 GTX DirectX: DirectX 9.1c Sound: DirectX compatible soundcard. Keyboard/mouse or gamepad required Internet Connection required for online activation. Recommended: OS: Windows XP (with Servicepack 3), Windows Vista (with Servicepack 1), Windows 7 Processor: Dual Core with 3 GHz Memory: 4 GB System RAM, 5,5 GB free HDD space Video Card: 1024 MB Radeon 4890 / GeForce GTX 260 DirectX: DirectX 9.1c Sound: DirectX compatible soundcard. Keyboard/mouse or gamepad required Internet Connection required for online activation.